Subacromial pain syndrome is a common cause of shoulder pain for which there is no consensus on effective treatment options. In patients with subacromial pain syndrome, ultrasound-guided percutaneous electrolysis plus standard therapy and exercise may not bring additional benefits in terms of disability and pressure sensitivity compared with therapy and exercise alone, according to findings published in the Journal of Pain. 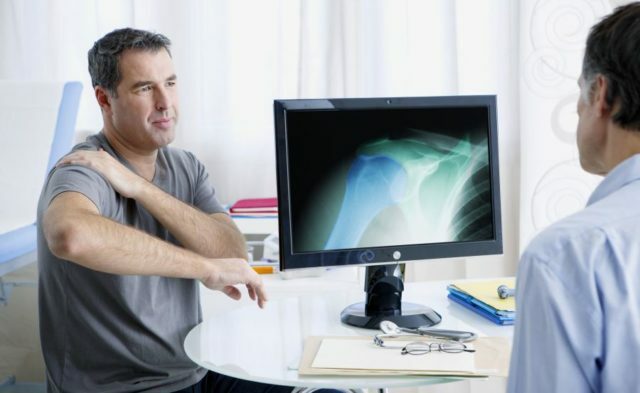 Subacromial pain syndrome is a common cause of shoulder pain for which there is no consensus on effective treatment options. Needling therapies, which deliver controlled microtrauma to the involved tissue, have recently garnered interest as potential components of multimodal approaches to the management of subacromial pain syndrome. In this randomized parallel-group trial (ClinicalTrials.gov identifier: NCT02569281), 50 participants were assigned to receive manual therapy and exercise (n=25; 52% women; mean age, 55.3 years) or therapy and exercise plus ultrasound-guided electrolysis (n=25; 56% women; mean age, 54.9 years). All individuals underwent once-weekly sessions for 5 weeks, with participants in the electrolysis group receiving additional treatment at each visit; all were assessed at baseline, 5 weeks, and 3 and 6 months posttherapy. The primary endpoint was the Disabilities of the Arm, Shoulder and Hand score. Secondary endpoints included measures of pain (Numerical Pain Rating Scale), function (Shoulder Pain and Disability Index), pressure pain thresholds, and Global Rating of Change scores. Disability scores and pressure pain thresholds were comparable between groups throughout the follow-up period (P =.051 and P <.001, respectively). At all follow-up visits, patients in the electrolysis vs exercise/therapy group indicated greater reductions in pain and shoulder function (P <.001 for both), with large effect sizes favoring the electrolysis group for both measures at 3 and 6 months. In addition, a greater number of participants receiving electrolysis indicated successful outcomes at 3 and 6 months (using the Global Rating of Change score; P =.006 and P <.001, respectively). Study strengths included its prospective nature and the use of blinding, allocation concealment, and intention-to-treat analysis. Study limitations included recruitment from a single center, possibly reducing generalizability, lack of a nonintervention control group, lack of sham electrolysis to evaluate placebo effect, inability to blind therapists to treatment, and use of a single dosage. “Based on the current results, we could anticipate a clinical benefit of adding [ultrasound]-guided percutaneous electrolysis to manual therapy and exercise for individuals with subacromial pain syndrome,” concluded the study authors.